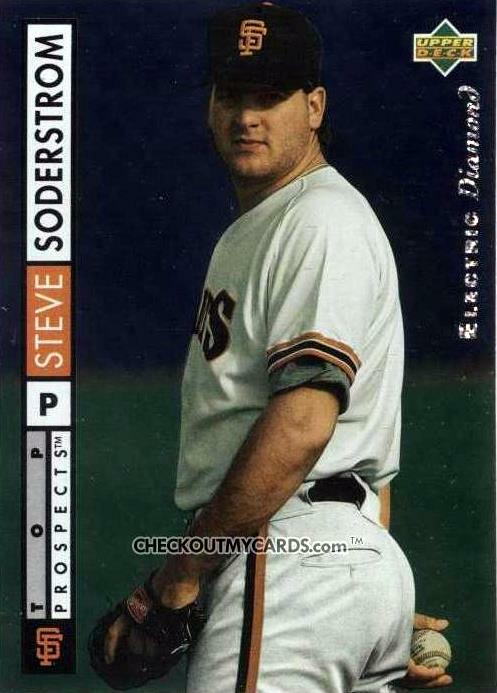 Barring a Moyer-esque debut by some 40 year-old rookie, only one player with MLB experience shares my day-month-year birthday, former San Francisco Giants 1st round pick, Steve Soderstrom. Several companies printed 1994 Soderstrom cards, thanks to his "drafted sixth overall" expectations (more scans at his COMC player page). This is Upper Deck's Electric Diamond parallel; note the sparkly, hard-to-scan text at far right. 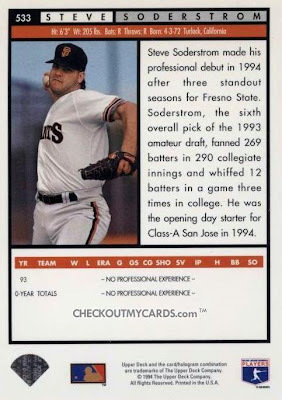 Soderstrom earned a late September call-up in 1996, where we went 2-0 in 3 games. Both wins were quality starts (6+ innings, <=3 earned runs), but he was back at AAA for 1997. Steve kept pitching through 2000 and collected his first homer that year for the Louisville RiverBats as a teammate of, among others, future football HOFer Deion Sanders. Happy birthday and good luck wherever life takes you, Steve! If so, HAPPY BIRTHDAY!! If not... HAPPY EASTER IN A FEW DAYS! !